Ketone salts (Keto//OS) are carefully formulated and contain the actual ketone betahydroxybutyrate bound to sodium, calcium and magnesium and can increase ketone levels much higher than coconut or MCT oil and could bring about even more improvement. 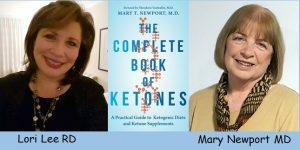 Using ketone salts could be part of the overall strategy to raise ketones, keeping coconut and MCT oil as the foundation. A healthy person could take a full serving of Pruvit KetoOS or KetoMax right away. For elderly people or those with chronic medical conditions I recommend getting doctor’s approval so that electrolytes can be monitored and I suggest starting slowly – 1 or 2 teaspoons once or twice a day and increasing gradually over a week or two as tolerated to 1/2 to 1 serving daily, or more as tolerated. Also very important – the person taking the salts needs to be able to drink plenty of fluids to avoid a dehydrating effect of raising ketones. The KetoOS 2.1 orange dream flavor is the ketone beta-hydroxybutyrate PLUS MCT oil powder with mild oragne flavor and stevia. Works well in hot or cold drink – tea (cold or hot), water or sparkling water. I know someone who doesn’t like it as a drink but puts it into Jello! !